There was one place Jim and I wanted to visit before leaving western South Dakota to go north. We’d been looking at options for visiting Devils Tower since our week in Wyoming. Initially, we thought we’d drive from Lusk to Devils Tower National Monument for a day visit on our way to South Dakota. Ultimately, we decided that was not the best route to take. Next, we thought we might slip back into Wyoming to visit the site on our way north, heading into the most eastern portion of Montana after to get on I-94 to go into North Dakota. Jim’s work with a looming potential of a need to fly to a client site for a week made us decided to ditch that plan, too. Our plan C is what worked for us. With Jim’s work for the week mostly complete except for conference calls on both Thursday and Friday mornings this week, we took Wednesday afternoon and drove to Devils Tower. Man, is it way out there! Was it worth the drive? Heck, yeah! However, after making the drive in the car, we are so very glad we did not take the 5th Wheel Why? First there were a good deal of up and down hills with decently steep grades. Next, there was quite a few sections with road construction, making some narrow one-lane road options. The big thing was the lack of space inside the park because it was packed with people, cars, trucks, RVs, and buses going in and out. Never in my wildest dreams did I expect that kind of crowd. There is designated RV parking, but I counted 3 or 4 non-RV vehicles taking up some of the signed RV only parking. 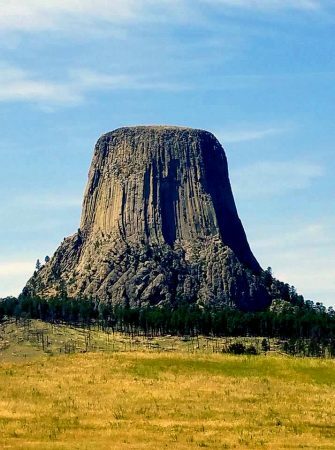 Now, that aside, When one first spies Devils Tower from afar, it looks huge even then, but by the time you are parked at the visitor center, literally in its shadow, it is amazing. Devils Tower, also known as Bear Butte Lodge, Bear’s Tipi, etc., is a laccolithic butte composed of igneous rock in the Bear Lodge Mountains. There are a few trails in the park, but the most popular one is the 1.3 mile trail around the base of the butte. If you want to read about how scientist think it was formed, read HERE. The park feels relatively small and the visitor center is one of the smallest I’ve been inside, but the park is popping with things to do from hiking to camping to Junior Ranger programs to rock climbing, etc. Please note that dogs are not allowed on the trails here. Without some sort of pass, the cost was $15 per vehicle. There are several food options outside the park entrance, and there’s even a KOA if you want full-frill camping nearby. This was interesting info inside visitor center. If we’d had more time; if the park had not been so packed, and if it had not been so hot, I’m sure Jim and I would have stayed longer here. Still, for us, it was well worth the 3 (or so) hour round trip from our campground in South Dakota to see such an unusual and magnificent natural wonder.